Note: If you are under 13 years old, please do not use e-mail to contact us. Either have a parent send an e-mail on your behalf, or use postal mail. Please understand that Bill can’t promise a reply. 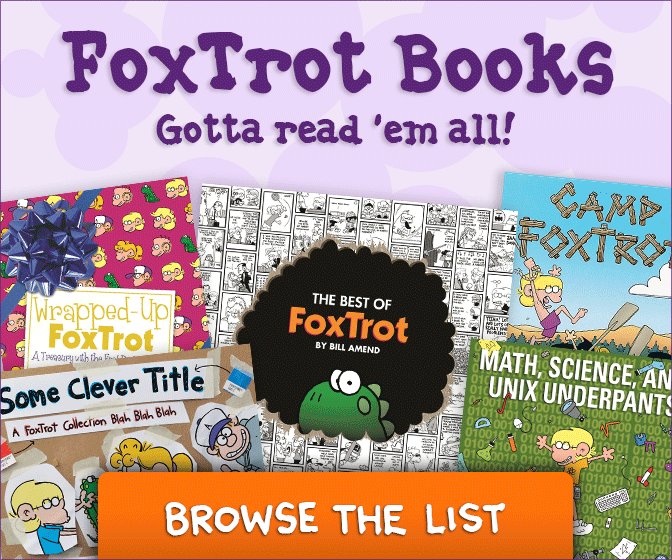 Andrews McMeel Syndication handles the syndication of FoxTrot to newspapers and other publications along with the granting of one-time rights and reprint permissions*. For reprint and permissions info, contact Raegan Carmona at rcarmona@nullamuniversal.com. For other matters, contact Shena Wolfe at swolf@nullamuniversal.com. *Educational and classroom uses are generally allowed without formal permission. See our Educational Re-Use info page for guidelines. This website is owned and operated by FoxTrot Labs, LLC.